As a chess mom, I thought it was fun to introduce my 7yo son who’s participating in a chess camp this summer. I am currently reading the book “Creativity, Inc” written by Ed Catmill, one of the early folks and current president of Pixar. He talked about how Geri’s Game was given to the director as an assignment to explore how to animate people better. A couple of minutes into the short film, you’ll probably forget that Geri is animated, not a grumpy old man. Mo Willems’ characters, Pigeons, Piggie & Elephant, and Edwina, are beloved by children, if mine are any indication. My friend Janette will be celebrating her daughter’s 4th birthday this weekend. I compiled this book collection to introduce a series of new characters to the birthday girl. The New York Times Book Review referred to Willem’s pigeon character as “one of this decade’s contributions to the pantheon of great picture book characters”. The Pigeon is whiny, shortsighted, narcissistic, needy, relentless and nakedly manipulative; in short, the Pigeon is a thinly veiled 4-year-old, drawn by Willems with a sure, simple line and a keen sense, as the pages turn, of comic timing. The “Edwina” book won a National Parenting Publications Award in 2006. I read this book to both of my boys and they always giggled when I say the name “Reginald Von Hoobie-Doobie”. Try saying that fast without smiling, I bet you can’t! When my older son was in kindergarten, his 3rd grade library buddy recommended books to him. In other words, she introduced “Elephant & Piggie” to our family. For that, I am forever grateful. Now my son started to read, we love acting out mini-plays as Gerald the Elephant and Piggie. If you are not already a Mo Willems fan, check out these books. You’ll love them. Every morning, my 4yo preschooler howls at dropoff. It’s truly agonizing for a working mom. He’s experienced separation anxiety nearly every day in the past couple of months. Today, I decided to introduce a new routine — read a book on a couch before kissing him goodbye — that I had used with his older brother, who’s now 7. This morning, we read “Who Feet Are These”. My son was excited to answer the question and flip each page to show me that he was right. Obviously, he’s read the book before! Illustrations were engaging and overall, it was quite a delightful book to add to a child’s collection! And he was so cheerful after book reading that he held his favorite teacher’s hand and was ready to start his day! I walked away with the biggest smile on my face. No more working mom guilt, well, for at least one day! Last week, I started playing the Sneaky Squirrel game with my 4yo son. While the spinner introduces random elements to the game, he seems to win the game all the day. For once, I see a confidant young boy who can stand up to his soon-to-be-7yo brother. And it’s a good thing! The tree shaped box stands up as one of the most clever designs. 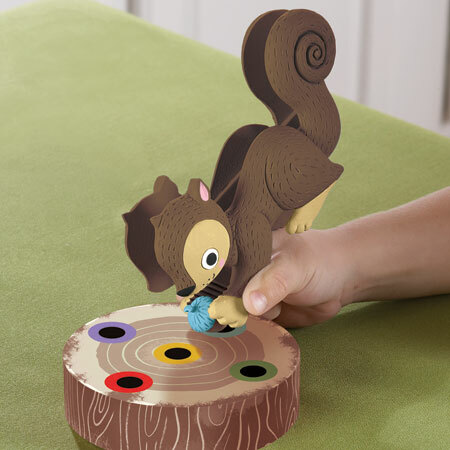 Then the squirrel squeezer makes a simple game just that more challenging for a preschooler. 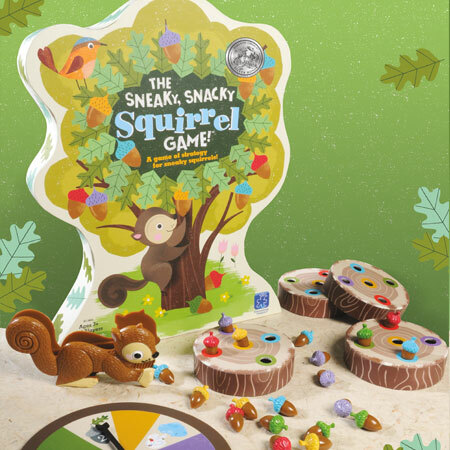 The spinner diagram is simply and containers colors, a snacky squirrel (lose a turn), and a sneaky squirrel (steal an acorn from your neighbor). As a mom, I enjoy playing a board game where my child exudes confidence! My 4yo boy fell in love with this maps puzzle after playing with his daddy a few times. 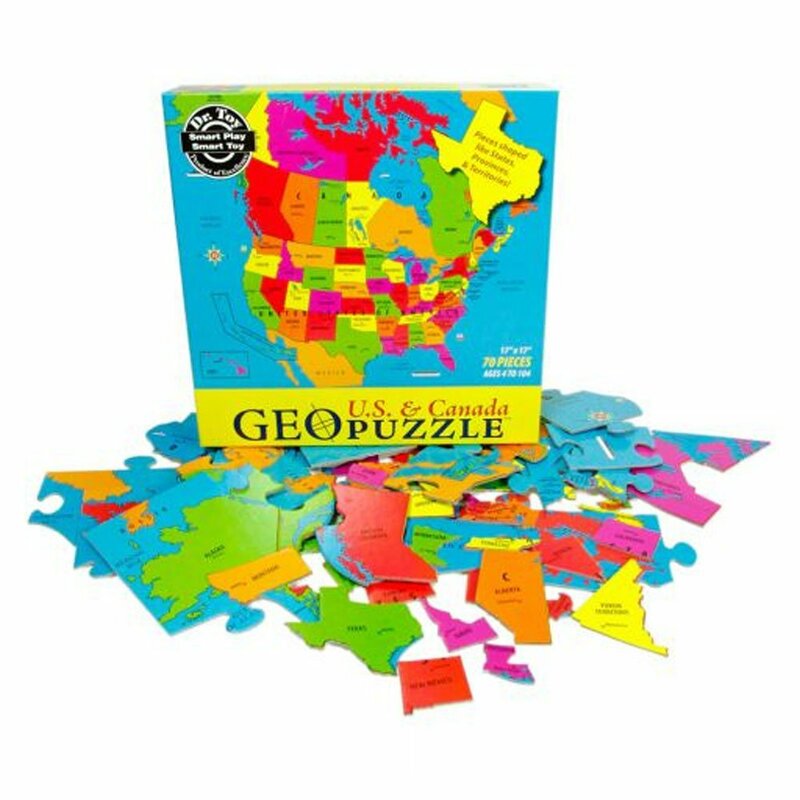 GeoPuzzle U.S.A. and Canada – Educational Geography Jigsaw Puzzle is a fantastic way to introduce geography to kids. It’s so adorable when my son says “Manitoba” in his sweet voice. Now he knows the Canadian province better than any other states because it’s right in the middle of the puzzle. I highly recommend it and am looking forward to playing with other versions of the puzzle. Every so often, I come across a product so clever that I would often pat my head and utter, “Why didn’t I think of that?” Aqueduck faucet extender is one of those ingenious products. It’s designed to fit on most conventional bathroom faucet. As toddlers become more independent, they want to wash their own hands. The biggest challenge is how far setup a faucet is. My sister got one for my son when he was 2 going on 3. He’s able to step on a stool and turn on water by himself. It’s available on Amazon and often is featured by Kidsteals.com. It’s truly a simple and elegant solution!